Midnight Man first appeared in Tesseracts Nineteen: Superhero Universe, and he’s one of my favourite characters to write. I am thrilled to place another story with Rhonda Parrish and to work with Tyche Books for the first time. I had a blast working with Rhonda on Equus, and getting the chance to launch that anthology at When Words Collide in Calgary. Looking forward to doing another launch. I’ve been kicking myself for not submitting to Tyche’s Masked Mosaic anthology ever since I had a chance to read it, so this is a great feeling. Huge thanks to Kevin Madison for this cover to a Midnight Man story I guess I’d better write. I love it! Hopefully, you’ll be reading lots more Midnight Man stories in the future, as prose, and as comics! Here’s the cover for Equus, edited by Rhonda Parrish and featuring a Thunder Road story by yours truly! I’m stoked to be sharing this anthology with some excellent writers, and some writers I’ve yet to discover. My story made the back cover copy! You’ll never guess which one is mine. Sold my first story of 2017! You’ll find my story, “Scatter the Foals to the Wind” in Equus, edited by Rhonda Parrish! This is another Thunder Road ‘verse story, but I don’t want to say much more than that at the moment, other than my story is fantasy and involves horses. Let the speculation begin! I’m In Grimdark Magazine Issue #5! 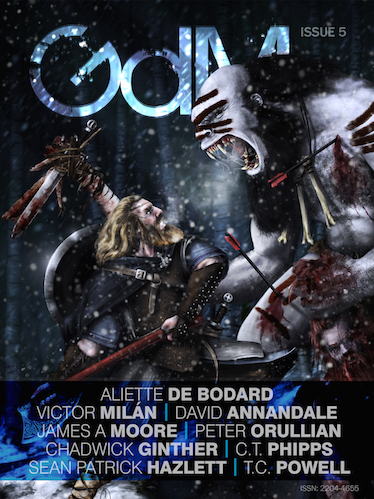 Grimdark Magazine Issue #5 has gone on sale, which means my Fungi story “First They Came for the Pigs” gets a second kick at the can. That cover looks great, and I’m very excited to be a part of this ToC. And in an incredibly Winnipeg thing to happen, I have the pleasure of sharing this issue with friend and fellow Winnipeg author, David Annandale. Something about our freezing winters or summer mosquitoes must make grimdark an obvious niche for us. The fine folks at Grimdark even made a trailer for the issue!